The cross is one of the rare surviving pieces which give substance to descriptions in contemporary documentary sources of the sumptuous church furnishings of pre-Conquest England. The enamels are unique in Anglo-Saxon art and may have been made by an English goldsmith familiar with German work. A fragmentary and not totally legible inscription around the edge of the cross seems to list the relics of saints once contained in the cavity beneath the ivory figure of Christ. This ivory figure was temporarily removed in 1926 for the purpose of being photographed and cast. Beneath it, lying in a hollow cut in the wood approximately 8.5 cm long, 2 cm wide and 1 cm deep was a dried human finger (perhaps a female index finger) pointing downwards with its outer surface to the front. Despite Papal disapproval of the dismemberment of saints, a finger relic was by no means unusual in Anglo-Saxon England: King Athelstan bestowed one third of his extensive collection of relics to the monastery of St. Mary and St. Peter at Exeter in AD 932. The gift included a finger, purportedly that of Mary Magdalene. Relics attracted the laity to a church. As court members in the heavenly kingdom, saints were held to be close to God. Believers considered the veneration of saint's relics (both the physical remains of saints and secondary relics such as clothing) a means to secure intercession on their behalf. Through relics, lay people sought mediation for their prayers, the care of their souls and also sought miracles and cures for their physical ailments. The New Testament refers to the healing power of objects which had been touched by Christ and the Apostles. The role of relics in miracle working increased in England in the tenth century, a phenomenon reflected in the contemporary compilation of miracle lists. Relics could be either the physical remains of saints or secondary material. Cross or crucifix reliquary. 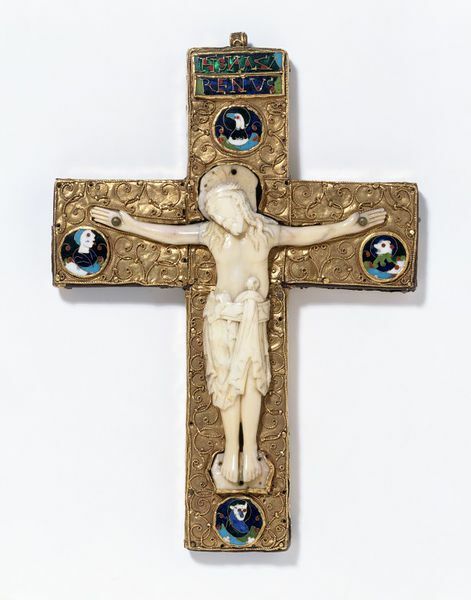 The body of the cross is of cedar wood, covered with sheets of gold, the back with repousse decoration now badly crumpled and flattened, the front decorated with filigree work, enamels and an ivory corpus of the figure of Christ. This is carved in walrus ivory. Haloed and crowned, the bearded Christ wears an elaborately pleated loin-cloth, knotted through the folded girdle. The head leans towards the right shoulder and the long hair falls in severe plaits onto the shoulders. The figure is held in place by golden nails through the palms. The titulus above Christ and four medallions with emblems of the Evangelists are of cloisonné enamel. The back of the cross shows the Holy Lamb and the emblems of the Evangelists in repoussé or beaten work. This inscription runs along the edge of the cross. Beckwith notes that the inscription shown here within brackets is coarsely executed and is of a different colour to the rest: it has been added at a later date. The inscription listed the relics formerly contained in the cross, apparently begining with a relic of the True Cross. The ivory figure was temporarily removed in 1926 for the purpose of being photographed and cast. Beneath it, lying in a hollow cut in the wood approximately 8.5 cm long, 2 cm wide and 1 cm deep was a dried human finger (male) pointing downwards with its outer surface to the front. On this outer surface it showed signs of being scraped and the bones even cut into, apparently to allow it to lie snugly beneath the ivory. At the same time, the four enamel plaques were removed and inspected, revealing their plain gold backs and that there are no hollows in the wood to house them. A mass of course glue (modern) was removed from the back of the figure and small portions of the finger before replacement. Historical significance: The cross is one of the rare surviving pieces which give substance to descriptions in contemporary documentary sources of the sumptuous church furnishings of pre-conquest England. The destruction wrought by Vikings, Normans and the Reformation have made such survivals so uncommon. The enamels are unique in Anglo-Saxon art. Marian Campbell suggests that they may have been made by an English goldsmith familiar with German work. Williamson believes them to have been made at the same time as the ivory figure and gold plaques. The ivory figure is distinctly Anglo-Saxon and bears a close resemblance to late tenth-century manuscripts such as the Ramsey Psalter and the Sherborne Pontifical. Peter Lasko describes the cross as "Winchester style". The English cult of saints may have rested on Romano-British foundations, however the return of Christian missionaries to the British Isles in the seventh century saw the cult of relics firmly established. Gregory the Great believed relics should be used in the conversion of heathen temples and in church dedication ceremonies and sent several relic gifts including 'Relics of the Holy Apostles and Martyrs" to Augustine. This provision of relics by the Pope reflected a desire to link the church in England to Rome. English churchmen such as Benedict Biscop deliberately sought out relics, in Frankish Europe and Rome, reflecting their desire to strengthen the authority of the church in England. In the seventh and eighth centuries, relics were sent as gifts between churchmen or as endowments for newly founded churches; they could also be purchased from their guardians and sometimes they were stolen. Relics could be either the physical remains of saints or secondary material. Despite Papal disapproval of the dismemberment of saints, a finger relic was by no means unusual: when King Athelstan bestowed one third of his extensive collection of relics on the monastery of St. Mary and St. Peter at Exeter in 932 the gift included a finger, purportedly that of Mary Magdalene. The patronage of saint's cults was a means by which kings could bolster their prestige in both heaven and their earthly kingdoms, over which they sometimes held only tenuous authority. From the later ninth century (or even earlier) king's had their own relic collections. Documents from Thorney Abbey relate how at the translation of St Botulf, King Edgar arranged for the remains to be divided into three: the head given to Ely, half the body retained for the royal collection and the remainder enshrined at Thorney. A royal relic collection provided suitable gifts for churches : Longhurst noted that a cross of gold and ivory apparently similar in form to the present cross occurs in an inventory of gifts made by King Athelstan (925-39) to the shrine of St. Cuthbert at Chester-le-Street. Rollason suggests that such English royal collections deliberately evoked the great collection of relics assembled by Charlemagne whom the English Kings may have wished to emulate. Relics were also important for the authority which they lent to oaths, such as that made in 876, when King Alfred made the Viking army swear to him on relics and in the Bayeux Tapestry in which Harold swears an Oath to Duke William. Relics could also be used in ordeals, manumissions (freeing of slaves) and penitential processions and were paraded in times of peril in the belief they would ward off attack. The holiest relics and therefore the most highly prized were those associated with Christ and his mother. The Cross was particularly venerated as the object most closely associated with Christ's humiliation and redemptive death. The True Cross was believed to have been discovered at Jerusalem in the course of excavations for the foundations of Constantine's basilica of the holy Sepulchre begun ca. 325/6AD. Details of the role played by Constantine's mother Helena in finding the cross are not mentioned in Eusebius Life of Constantine and may be apocryphal. Veneration of the True Cross in Jerusalem is referred to in the Catecheses of Cyril of Jerusalem, dating the earliest reported practice to ca. 340AD.Although relics of the cross proliferated after this date they lost none of their spiritual potency and were frequently used as gifts between royalty and the upper echelons of the clergy : Radegunda, Queen of the Franks obtained a relic of the True Cross from the Emperor Justin II, in 569 and Gregory the Great (540-604) sent a portion of the Cross to Theodolinda, Queen of the Lombards and another to Recared, the first Catholic King of Spain. The importance of The Cross in Anglo-Saxon christianity is reflected in the erection of monumental stone crosses, a type of monument unique in early medieval art, the finest examples of which are the Ruthwell, Bewcastle and Easby Crosses. Two poems from the period: Caedmon's Dream of the Rood and Cynewulf's Elene provide further evidence of the key role of The Cross in Anglo-Saxon christian faith. The Dream of the Rood contained in part on the early 8th century Ruthwell Cross and in full in the10th century Vercelli Book, relates the crucifixion of Christ in the words of the cross. Elene, a 1321 line poem, is the earliest and most elaborate English account of the finding of the True Cross by Constantine's mother - Saint Helena. The body of the present cross is of cedar wood, a variety native only to the Mediterranean and Himalayan regions and not therefore indigenous to Britain; the wood for the cross itself was brought from the Mediterranean and was probably considered a relic of the True Cross. The Golden Legend which relates details of the Legend of the True Cross records a tradition that the cross was fashioned of four different woods: cypress, olive, the wood of the palm-tree and cedar. Examples of Anglo-Saxon reliquaries which were worn have been recorded (The Life of bishop Wilfrid records that Queen Eormenburg possessed a reliquary which "she wore as an ornament both in her chamber at home and when out riding abroad in her chariot"). However, the size and weight of the present cross suggest that it was unlikely to have been worn as a pectoral cross, and more probable that the suspension loop allowed it to hang above an altar or shrine. Gold sheet on a cedar base, the figure of Christ in walrus ivory, the titulus and medallions in Cloisonné enamel. A badly damaged and fragmented inscripton around the edge of of the cross appears to list the saints' relics once contained in the cavity beneath the figure of christ, and the cross may itself be a relic of the True Cross. All that now remains in the cavity is part of a human finger, probably female. The wooden cross and the metalwork decoration applied to the back and sides set on an Ottonian reliquary cross Germany 900-1000, Ivory figure and decoration applied to the front of the cross made in England ca.1000.